In the early 1950s, during one of the periodic booms in popularity for traditional folk music in the United States, Pete Seeger was in one of the biggest groups going, The Weavers. Then Seeger was tagged as a communist, and placed on the unofficial “blacklist” by radio, film, and TV executives—where he remained for the next decade, even after the McCarthy era faded and folk music resurged. By 1960, Seeger was supporting himself by touring steadily and stealthily, performing “community concerts” on college campuses and elsewhere. This week, Smithsonian Folkways released The Complete Bowdoin College Concert 1960, a nearly two-hour recording of one of those Seeger gigs. It’s a superlative example of Seeger’s approach to folk music, which is at once pedagogical and participatory. Seeger was never like one of those professors who passes out syllabi and writes each day’s lesson plan on the whiteboard; he was more the kind who wanders in a few minutes late, starts talking extemporaneously about the ritual chanting of South American tribespeople, and then gets the entire class to start singing in unison before they’ve fully grasped what’s happening. The biggest star to emerge from the early-’60s Greenwich scene was of course Bob Dylan, whose combination of talent, charisma, and opportunism helped him outpace his contemporaries, including friendly (and sometimes not-so-friendly) rival Phil Ochs. 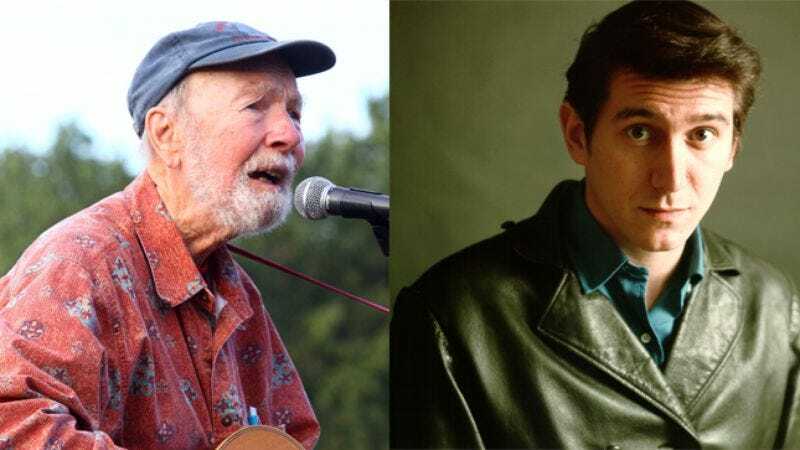 While Dylan was more overtly Guthrie-ish in his overall persona, Ochs tended to be more like Seeger, with his sweet voice and passion for political songs. Dylan once famously said to Ochs, “You’re not a folksinger… you’re a journalist,” and was known to rib Ochs for writing so many specific songs about civil rights and the Vietnam War. But Ochs’ keen intellect and focused outrage made him a cult favorite, and his early albums All The News That’s Fit To Sing and I Ain’t Marching Anymore became touchstones for the rising generation of activists. As the decade progressed, though, the biggest issue dividing folkies was whether they were committed to the message first and foremost, or to the music. Dylan adapted as necessary. He openly swiped tunes from old folk songs, and even arrangements from his peers—neither of which were uncommon practices—and when his songs began making their way into the repertoires of pop, soul, country, and rock artists, Dylan “went electric” himself, scandalizing some of the purists who felt he’d sold out the movement. Ochs wasn’t one of those purists. He coveted Dylan’s fame, and signed on with Dylan’s manager for a time, until he realized he’d always be a lower priority. Then in 1967, as the Village was being overwhelmed by druggies and opportunists (similar to what happened to Haight-Ashbury in San Francisco), Ochs switched labels from Elektra to A&M, and moved to California to remake himself as a folk-rocker. Actually, “rocker” isn’t entirely accurate. Ken Bowser’s 2010 documentary Phil Ochs: There But For Fortune (available now to watch instantly on Netflix, by the way) contains a vintage interview with Ochs in which he explains that he didn’t just want to put a rock ’n’ roll beat behind his songs, the way so many others were doing. Ochs wanted to rethink his music entirely, coming up with a sound that mixed elements of pop, classical, and traditional folk. While the rest of popular culture embraced heavier, louder, more aggressive music, Ochs was noodling with strings and flutes and pianos, and losing some of the leftist critical support he’d enjoyed when he started out. Ochs still drew crowds to his concerts—especially the “yippie” crowd, with whom Ochs participated in pieces of guerrilla street-theater—but his albums failed to make him a household name, or to revolutionize folk. Still, those late-’60s albums by some of the best-known folkies of the early 60s’ are some of the most fascinating music of the era, because even when they don’t wholly work, they’re a document of talented singer-songwriters fighting to stay relevant, and to hold onto the ears and minds of the young. They were wrestling with their own identities, applying to themselves the same kind of scrutiny that they’d given to big business, the government, and advertising agencies. And some of the more baroque folk-rock records are genuinely beautiful, such as those of Tom Paxton, Tom Rush, and Fred Neil. There are multiple levels to many of these albums, as the singers work their way fitfully through an ongoing conversation with their audience and with the industry. Not since Pete Seeger has there been a folksinger of Ochs’s stature who could claim his unswerving opposition to political and economic oppression. But Ochs never fell into the trap of purism. He both loved America and respected Americans, and he always remained aware of the elitist pitfalls awaiting those who would shape its art and its politics. Folk music though had changed all around Ochs, following the lead of singer-songwriters like Joni Mitchell and James Taylor, who worked more in the vein of personal narrative and allusive poetry than of social protest. While the rest of popular culture in the early ’70s took on a grittier, more “relevant” tone, folk music became softer and prettier, taking its cues from Laurel Canyon instead of Greenwich Village. Ochs never got the chance to make his Court & Spark—or even his Blood On The Tracks. His pop albums were too idiosyncratic, and his politics too confrontational. He wasn’t made for mellow. As for Seeger, he’s still out there at age 92, playing when he can, and teaching and encouraging. In some ways, the Bowdoin College Concert CD set is a time capsule, as Seeger sings about the quiz-show scandals and elicits nervous-sounding laughter from the audience with his spoof song, “What A Friend We Have In Congress.” Yet there’s not that much difference between Seeger in 1960 and Seeger in 1980, or even now. Seeger may have inspired people like Dylan and Ochs and Paxton to take up folk music, but outwardly at least, he never seemed to have their restlessness. He experimented a little with fuller arrangements and electric instruments, just as everybody else did in the ’60s and ’70s. But he wasn’t trying to start a musical revolution. Seeger preferred to work piecemeal, getting crowds on his side with disarming ditties before transitioning effortlessly to politics, while always letting people know that, “You don’t have to sing along if you disagree.” And if you do want to sing along? Well, that’s how Seeger gets you.